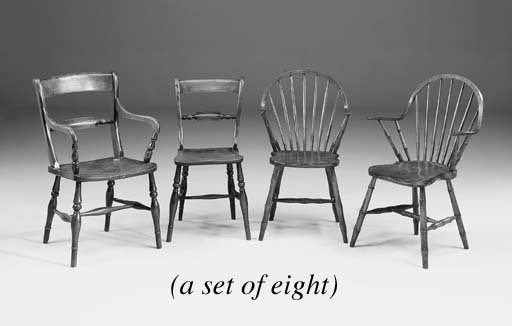 A similar set of eight chairs all stamped S. HAZELL OXFORD were sold in these rooms on 3 November, 1999 as lot 1013. Stephen Hazell Snr. (born 1819) became a most significant Oxford chairmaker and he chose to stamp his name on his chairs, thus leaving behind him a firm record of those chairs that he and also his son, Stephen Charles Hazell (born 1846), made. Stephen Hazell Snr. first advertised himself as a chairmaker in 1846 and the business continued until his son's death in 1898. For a fuller discussion of this tradition, see Dr. B. Cotton, The English Regional Chair, Woodbridge 1990, pages 91-94 and page 90, fig. TV208 which illustrates two similar chairs. Please note that the two chairs illustrated with this lot are not inclueded in this sale.